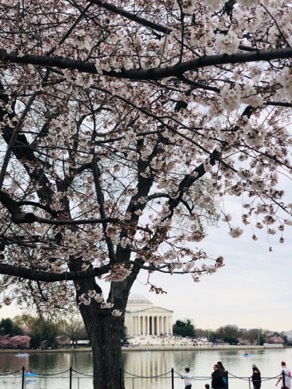 Welcome to springtime in Washington, D.C. As you walk down the street, you’ll find yourself surrounded by clusters of cherry flowers from the 3,000+ cherry trees planted around town. Peak season just started, and it lasts anywhere from four to seven days. Take advantage of the most beautiful season in D.C. by taking great photos or setting up a breezy picnic. Or sit under a cherry tree with a book open on your lap or watch the sunset across a cluster of cherry flowers. 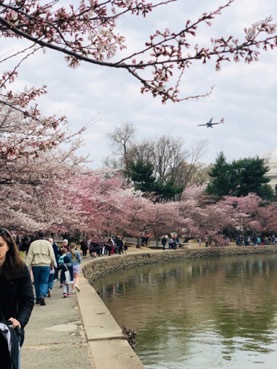 Here are 10 things to do while the cherry blossoms cover Washington, D.C. in pink in the springtime. 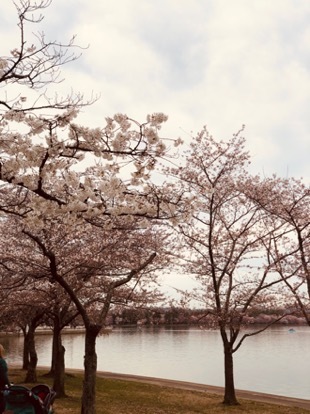 Kick off your journey by walking around the Tidal Basin. Avoid the crowds by getting up early in the morning. Or roam the banks at sunset to see a unique mix of cherry pink and sun red. If you come with someone special, rent a paddle boat and cruise around the Potomac River. Or stretch out your calves by jogging around the banks. Lie down on the lawn and enjoy a peaceful moment with your favorite book in hand. Worried about the weather taking a turn? Bring an outdoor waterproof blanket and a rain coat. And map out where you can take cover until the sun comes out again. Go see the Washington Monument and Thomas Jefferson Memorial. 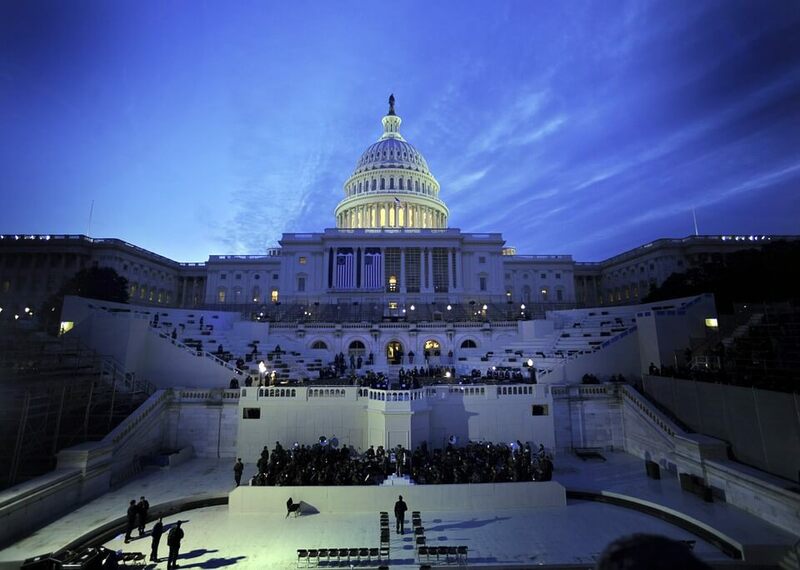 The 32,34, or 36 Metrobus routes will take you to a stop at the National Mall near Washington Monument. From there, navigate by foot or rent a scooter. History lovers, don’t miss out on U.S. Holocaust Memorial Museum and World War II memorial, just a 10-minute walk away. Or check out the George Mason Memorial, Franklin Roosevelt Memorial and Martin Luther King, Jr. Memorial. As temperature heats up, cool down with a bike ride. Capital Bikeshare program in D.C. offers hundreds of docking stations around the town. It only costs $2 for a 30-minute trip. Not familiar with roads in D.C.? Guided bike tours like Bike and Roll will help you explore the surrounding neighborhoods. 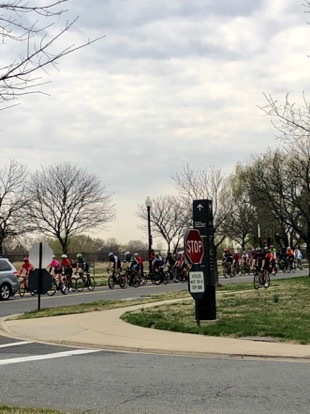 The area near Tidal Basin is paved with a bicycle-friendly wide paths. East Potomac Park is a man-made park in the Potomac River. Although views of cherry trees will steal your heart once at first sight, you’ll find plenty more to do here. The park is home to three golf courses, a three-hole practice area, spacious driving range and the East Potomac Tennis Center. The tennis center includes five indoor hard courts, 10 Har-Tru clay courts and another nine outdoor. Entrance to those facilities are free. Arriving early will to secure a spot during peak bloom period. When’s the last time you have a heart-to-heart talk with bae? Chit-chat about your hopes and dreams over delicious food. Hains Point Picnic Areas of East Potomac Park has four picnic areas. “I went to D.C. on a family trip three years ago. 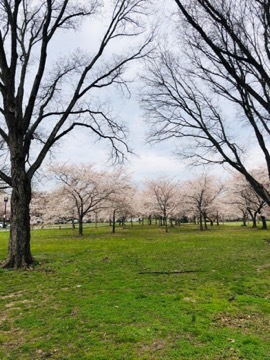 I still wish we could have had a chance to spend an afternoon catching up over some food under cherry trees,” said Boston University student Gloris. 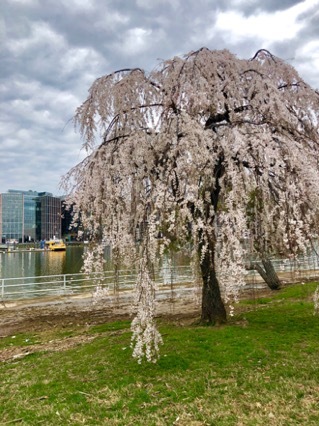 You’ll get beautiful views of cherry blossoms against Potomac River, Anacostia River and the Washington Channel. 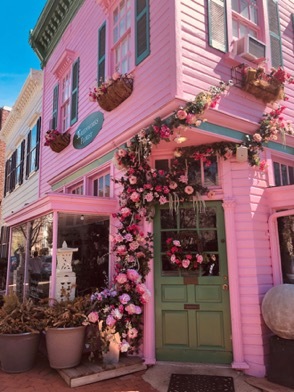 Everything from colorful houses to flowers blooming out of the windows, will catch your camera’s focus. “There are so many decent places to dine out in Georgetown. My favorite is Clyde’s where you will find some amazing recipes for crab cakes,” said New York University D.C. student Amber Wang. She also recommended the seasonal Cherry Blossom Cupcakes from Georgetown Cupcakes. “I went there last week with my friends from Georgetown University. It’s totally worth waiting in line for it,” said Wang. When I was a kid, flying home-made kites in spring was an annual routine for me and my grandpa. He knew some tricks and controlled the direction of kites flying in an easy-breezy way. 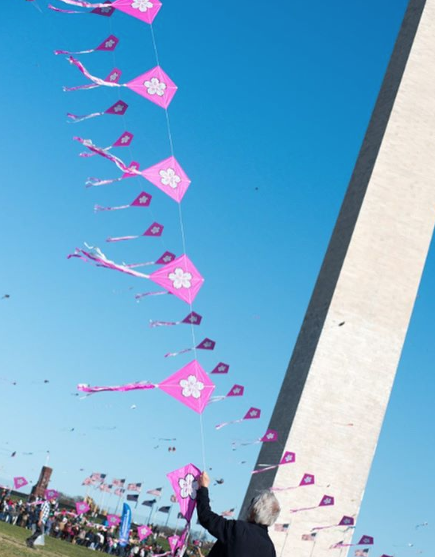 Every year, D.C. hosts a Blossom Kite Festival at the National Mall. With the Washington Monument as the backdrop, seeing the kites soaring in the air makes for an unforgettable experience. For those who didn’t see the firework show on Fourth of July, the fireworks display in Petalpalooza is your make-up. 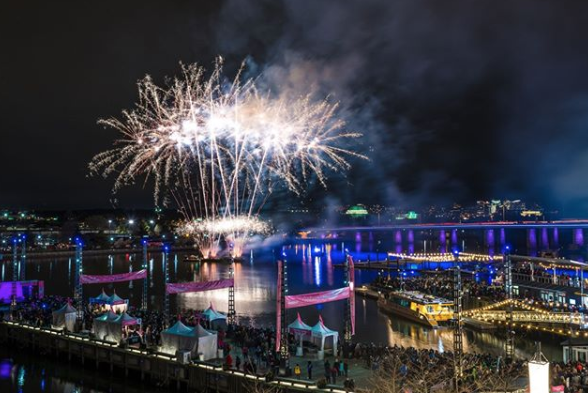 Besides the fireworks display, outdoor live music and a beer garden, food stands on the roadsides give you every reason to go out and celebrate the spring on the waterfront. Plus, the event is free. Fireworks will go off at 8:30 p.m., so show up early to stake out a good spot. Bands and performers will get the crowd going. Try to spot if your celebrity crush is in the marching crowds. Grandstand seating starts at $20 and you can choose to stand along Constitution Avenue between 9th and 15th St NW for a free peek.